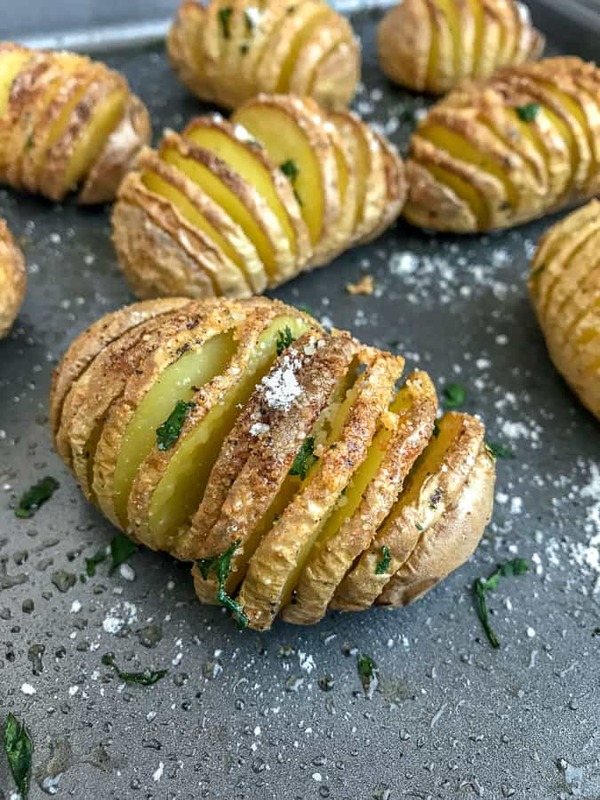 If you’re a crispy potato person, then you are going to love this recipe! 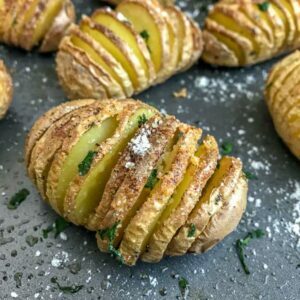 These Mini Garlic Butter Parmesan Hasselback Potatoes are going to wow you, as well as your guests. They are easier to make than you think! The only challenge? Trying not to slice too far into the potato that you cut a full slice, while cutting it enough to create an accordion style look to fill with butter, herbs, and parmesan cheese. 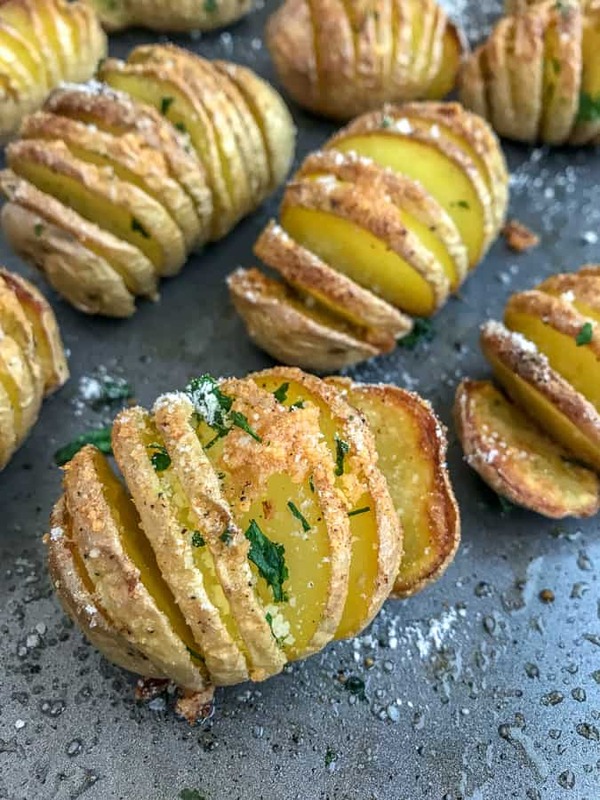 There are a lot of methods out there for making slicing potatoes hasselback style easier. Some show using chopsticks on either side of the potatoes or thin wooden spoons, etc. 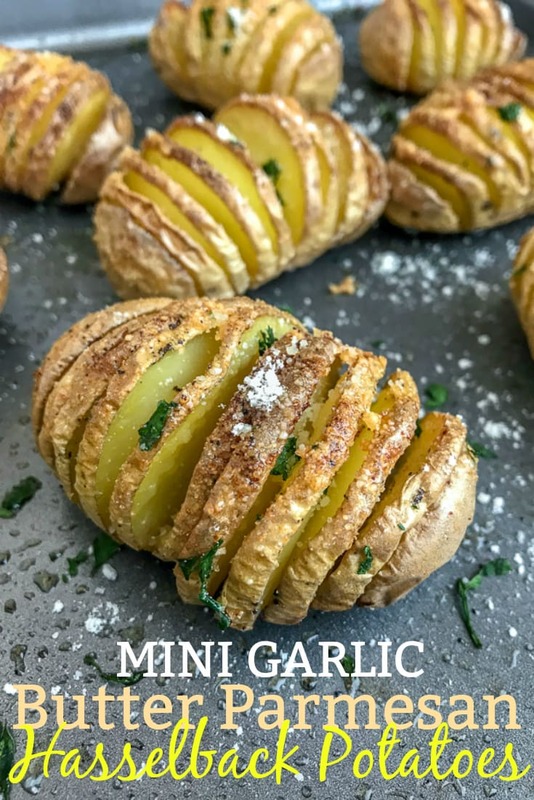 These are wonderful methods to stop your knife as you are slicing, but as many times as I have made these Mini Garlic Butter Parmesan Hasselback Potatoes, I find it a hassle to keep the chopsticks from moving and against the potato. For me, I find it easier to have a firm grip on one chopstick and the potato as I slice. Do what works best for you. If you don’t have chopsticks, you could use skewers – wooden or metal. Just slice slowly and gently so that you can control how far down the potato you slice. Do you need to use mini baby yukon potatoes? Nope! 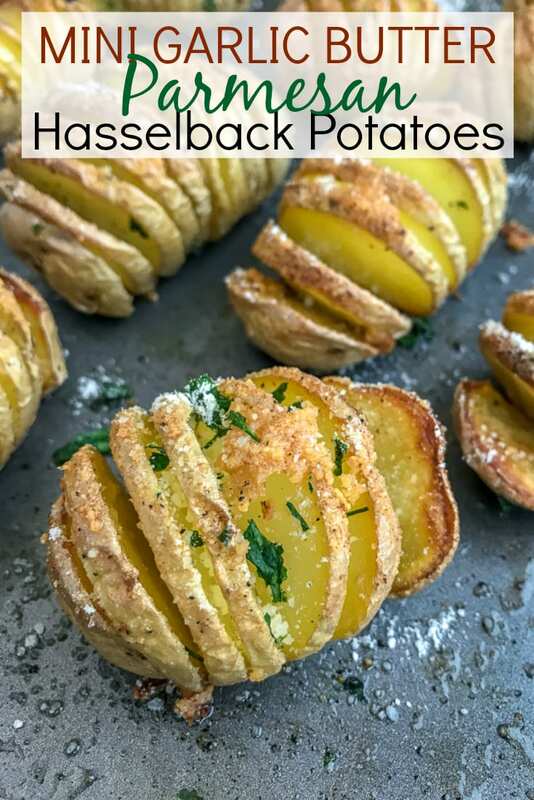 You can make this recipe with larger potatoes, yukon or russet style. I find these two crisp the best. 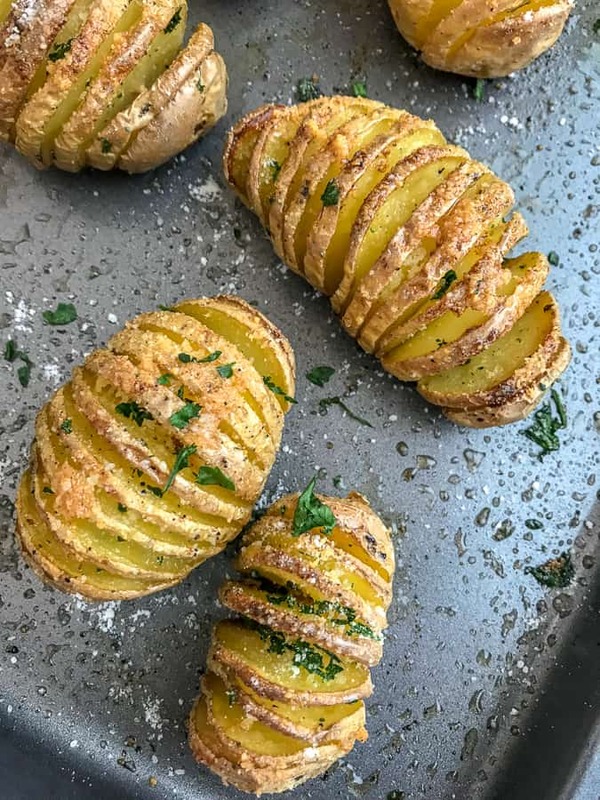 Once you’ve sliced the potatoes hasselback style, simply coat them in olive oil and seasonings. Drizzle with butter and bake! Depending on the size of your potatoes, the baking process should only take about 40-60 minutes. Baby yukon potatoes (for me) take approximately 40-45 minutes. Look at that crispy perfection. Makes me wish I could reach through my screen and take a bite out of one! Wouldn’t you agree?? Garlic Butter Steak and Potatoes – a very easy main dish that comes together in no time! Full of flavor and sure to be a hit with your entire family. Easy Tender Instant Pot Turkey Breast – looking to enjoy a homemade turkey breast, but without the early morning or basting hassle? Then try it in the Instant Pot! Done from start to finish, including gravy, in just over an hour. Crazy, huh? 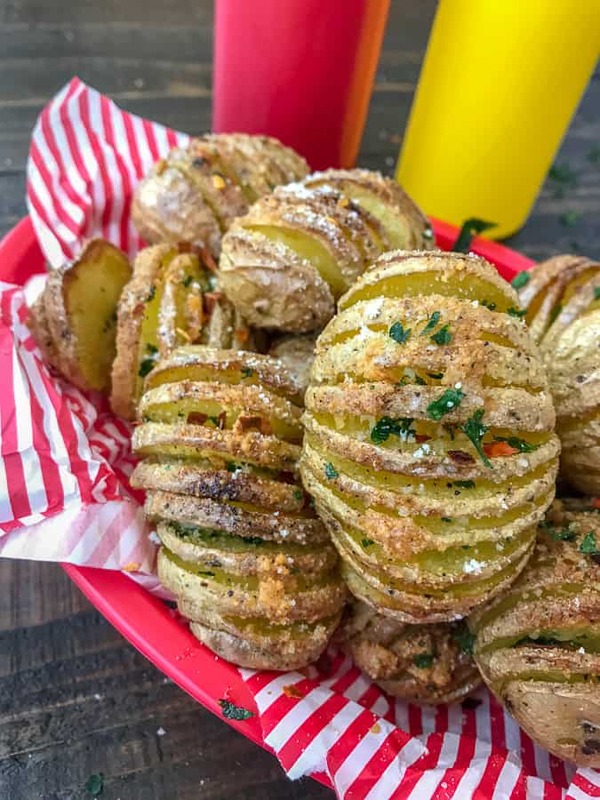 Super Crispy Garlic Parmesan Potato Bites – if you love super crispy french fries, then you will absolutely LOVE these potato bites! full of flavor and crispy crunchy! One Pan Lemon Garlic Butter Chicken and Potatoes – an easy, one-pan recipe that comes together in no time and is full of delicious flavors! Chocolate Chip Pumpkin Pecan Cookies – looking for an easy, delicious, and low-calorie dessert to enjoy after dinner? Try these cookies! So so good and perfect for on-the-go days, breakfast, or an after school snack! Delicious and easy side dish that comes together in no time. Crispy on the outside, soft on the inside, and flavorful throughout. Preheat oven to 425 degrees F. Spray or brush a baking sheet with oil. Using a sharp knife, cut slits into each potato, approximately 1/8 of an inch apart, being careful not to slice all the way through. You can use a wooden spoon, chopsticks, or skewers on either side of the potato to help stop the knife from slicing all the way through. Whatever works easiest for you! To a large mixing bowl, toss the potatoes with the olive oil, thoroughly coating each one. Arrange the potatoes on the baking sheet. Brush the melted butter over each potato and the sprinkle each with the salt, pepper, and garlic powder. Make sure to get in between the slices of the potatoes with the butter and seasonings. Bake for 20 minutes. Remove to sprinkle with parmesan cheese. Return to the oven to bake for an additional 20-25 minutes, or until they are crispy on the outside and fork-tender on the inside. Remove from the oven, sprinkle with more parmesan cheese and freshly chopped parsley. Serve immediately.